A tasty cookie for the Autumn/Winter season and a lovely hostess gift or party favor along with the recipe! 1. Reserve 2 Tbsp. candied ginger for decoration. In a large bowl, cream together butter and 1 cup sugar with a pastry blender or a mixer at low speed. Add molasses, egg and remaining candied ginger, beating until well blended. 2. In a separate bowl, sift together flour, baking soda, cinnamon, cloves, ginger and salt. Add to butter mixture and mix well. Cover and chill in refrigerator overnight. 3. Form dough into 1 inch balls. Roll each ball in granulated sugar and place on greased cookie sheets 2 inches apart. 4. Bake at 375°F for 6-8 minutes or until golden brown. Let stand 1 minutes and remove cookies to wire rack to cool. 5. Melt chopped chocolate in a double boiler or microwave. Using a fork drizzle melted chocolate over cookies. Before chocolate sets, sprinkle tops with reserved candied ginger. 6. After chocolate is set, place cookies in an airtight container and store in a cool place 1 week or freeze for 1 month. For your next tea party, we invite you to visit Teapots ‘n More and browse our selection of authentic English bone china tea sets, teapots, tea accessories and antique tea cups. Great apple pie flavor in a moist cake with a “cookie-crunchy” crust. Delicious and easy! Makes 24 bars. 1. Sift dry ingredients together into a bowl and set aside. 2. In an electric mixer, beat oil and eggs until creamy. Add the sugar and vanilla and mix well. 3. Slowly add the dry ingredients to the egg mixture until combined. The batter will be almost like a paste. Fold in apples with spatula or wooden spoon. 4. Spread batter into a greased and floured 9″ x 13″ pan. Bake at 350 degrees F for 45 minutes or until a knife inserted in center comes out clean. Let cake cool, cut into 24 bars and dust with powdered sugar. You’re invited to click Teapots ‘n More and browse our selection of teapots, tea accessories, teacups, tea miniatures and elegant tea sets. As the weather in Southern California is finally starting to hint at autumn (a cool 78 degrees! ), our thoughts around the office are turning gratefully to rainy days, good books and a good cup of hot tea! It’s funny what you miss when you don’t have it. In the middle of January, I’m sure we’ll be looking fondly toward Summer having forgotten the sweltering heat. With those thoughts in mind, it occurs to me that now might be a good time to post a refresher on making that spicy good tea, Chai. Much has been written on this cold weather favorite, so let’s just share the brewing basics. Brewing Chai: Place 1 heaping teaspoon of tea for each cup into your teapot. Pour boiling water into teapot. Cover and let steep for 5-10 minutes – yes, this is more tea and a longer steeping time for a good strong brew. While the tea is brewing, put 1 teaspoon of sugar in each of your cups – this can be adjusted to taste, artifical sweetner also works fine. Adding sweetner helps open up the exotic flavor of this spicy blend. Add milk to your cups (about 20% of the cup’s volume). When the chai is ready, strain into cups and enjoy. Personally, I use one packet of Splenda – yes, I know it might kill me. AND I do use cream instead of milk because I like the added body and that “slickery” feeling the cream offers. If you like a full bodied tea with strong flavors, we highly recommend Chai tea. It’s a terrific brew for Autumn & holiday gatherings. 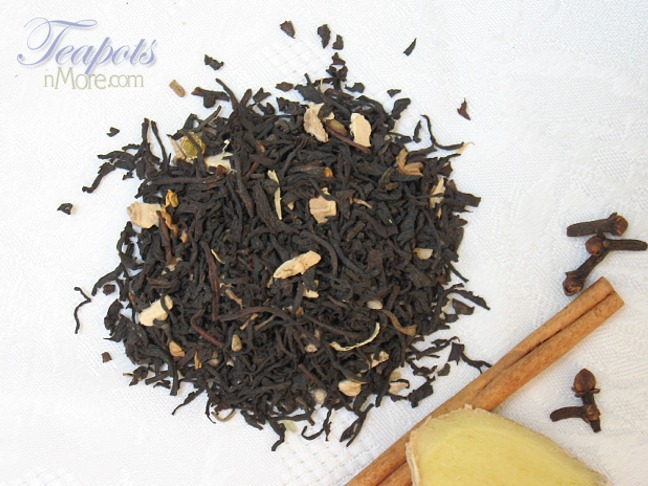 We have an exceptional Vanilla Chai available in our store, should you like to indulge yourself. As always, we’d love to hear your thoughts! You’re invited to click Teapots ‘n More and browse our newest selection of teapots, tea accessories, teacups, tea miniatures and english bone china tea sets. *For these recipes, check out our free tea recipes blog: teapotsnmore.wordpress.com. You’re invited to click Teapots ‘n More and browse our newest selection of teapots, tea accessories, tea spices, tea miniatures and elegant tea sets.